3,000 green hard hats symbolizing green recovery made a memorable mark among the 35,000 people who turned out for the Put People First march at the G20 in the end of March. 124,704 people signed a petition to save the Canadian Broadcasting Corporation in just 12 days in March and April. $260,308 was raised to donate communications equipment to Tibetan civil society groups who keep Tibetans connected to the rest of the world. Avaaz has had a deep impact on a variety of social justice issues in just two years of existence. Currently clocking in at 3.4 million members, Avaaz has built its membership – drawn from every country in the world – based on a very simple mission: “to close the gap between the world we have, and the world most people everywhere want.” (Avaaz 2009). Based on an internally coherent ideoscape, Avaaz represents an alternate reading of globalization as a force in shaping the 21st century and applies a model informed by the modern technologies of network and hybridized identities to pursue its mission. Stealing an apt metaphor from Maira and Soep, Avaaz can be perceived as both the figure, or the central focus of globalization, as well as the ground for diving deeper into key themes of globalization such as hybridities, oppositional politics, networks, bridges and disjunctures (xxxiv). I will examine Avaaz in both ways throughout this paper – as the figure in terms of its organizational structure and role as a megaphone to the world for its members, and the ground against which members and other players in the global space interact in complex ways to affect issues relevant to the local and global spaces. My analysis applies insights from key works of social movement theory and globalization theory to interviews with two of Avaaz’s 11-member team of staff as well as content from and analysis of some of their media products, namely their website and an online video. I also include an extended discussion of two assessments of MoveOn, Avaaz’s model, as they relate to Avaaz. Roots in the New Media Progressive Movement Avaaz launched in January of 2007, co-founded by Res Publica, a global civic advocacy group, and MoveOn.org, a high-profile Internet-based advocacy group in the United States (Avaaz). The co-founding team also included global social entrepreneurs from six countries, including founders of Getup!, Australia’s version of MoveOn (Solomon). During their first year of existence, Avaaz carried out campaigns ranging from nationally-targeted issues in countries including Burma, Tibet, Zimbabwe and Iraq to globally relevant issues like climate, poverty, and de-armament (Avaaz). In just two years, Avaaz has grown to a membership of 3.4 million members, breezing towards their initial five-year goal of five million members with ease (Patel). With their website now available in 14 languages, the organization has accordingly set their sights higher, with a new goal of recruiting one percent of the global Internet population in five years (Patel). Avaaz’s model of Internet advocacy follows the original MoveOn playbook, so previous analyses of the MoveOn model from social movement literature can be usefully applied to Avaaz. Andrew Chadwick makes a compelling argument for understanding MoveOn as a new type of organization that maneuvers between one of three organizational models defined by political scientists, parties, interest groups, and social movements (283). In assessing how MoveOn moves between these identities, Chadwick applies the concept of repertoires of collective action first proposed by Charles Tilly. Traditionally, a repertoire of collective action collects an organization’s structure and tactics into a values-based strategy that defines their organizational structure. Chadwick believes that repertoires shape collective identity and “are not simply neutral tools to be adopted at will, but come to shape what it means to be a participant in a political organization” (285). Chadwick also explores what it means to be a member or supporter in the new online activist space. He sees MoveOn functioning with a shallower level of involvement among its membership than traditional membership organizations. “MoveOn asks for volunteers and donations in its e-mail newsletters and occasionally uses the term “member” to refer to its supporters, but there is no fixed annual membership fee nor is there a formalized local branch structure to maintain.” MoveOn also provides many opportunities for members to meet on a local level, through rallies, meetups and other campaign-related activities that have brought thousands of members face to face over the years. Avaaz functions in a very similar way, but with less face to face engagement due to the far-flung nature of its membership. However, the organization does rely heavily on its members not only for funding and participation but for ideas and direction. Inspired by Rheingold’s work with smart mobs, Chadwick writes of MoveOn’s “dynamically shifting aggregation of individual decisions,” a strategy which also informs the Avaaz policy decision-making process (297). In 2007, Avaaz was 85% member-funded, having raised over $5 million in just two years (Patel). Avaaz holds rallies and protests, like the Put People First march held in London in March, and also invites members to attend dinners and receives thousands of member emails a week. Campaign ideas are tested and inspired not only by member emails and media audits but by regular tracking poll data which Avaaz gathers on a weekly basis (Solomon). The network of members Avaaz has set up is at its core a bridging network, one which cuts across social boundaries. Members of bridging networks are more likely to come into contact with “diverse others” unlike a bonding network, which tends to attract people with a similar background and may further social isolation (Coffé and Geys, 358). Coffe and Geys state, “bridging networks are generally thought to represent a ‘bright’ side of social capital and to have positive effects on the wider society. Bonding associations, conversely, have been related to a ‘darker’ side and lacking beneficial externalities” (358). Bridging networks help shape globalization into a positive force by overpowering disjunctures through the spread of information. The member network of Avaaz can also be understood in the context of an imagined community. Benedict Anderson wrote the following in defense of his concept of nations as imagined communities: “It is imagined because the members of even the smallest nation will never know most of their fellow-members, meet them, or even hear of them, yet in the minds of each lives the image of their communion...” (1991). For its members, Avaaz can be the site of that communion on a global scale in larger or smaller degree, since most members will never meet each other in-person or even have any kind of direct online exchange. Anderson also identifies a less desirable outcome of the affiliation of imagined communities: “Ultimately it is this fraternity that makes it possible, over the past two centuries, for so many millions of people, not so much to kill, as willingly to die for such limited imaginings” (1991.) Avaaz also prompts its members to actions they would otherwise not take, but none as fiercely destructive as what Arnold identifies. Ricken Patel, executive director of Avaaz, describes the effect of Avaaz on some members as an important step in becoming more engaged with global affairs. While some are already involved in other change-making organizations such Greenpeace or the World Wildlife Fund, Patel estimates that about a third of Avaaz members tell a common story that, before learning about Avaaz, they didn’t believe the world could change and didn’t believe they could change the world. In this way, Avaaz offers not just a site of agency for members, but an imagined community that prompts its members to acquire a new shared vision and set of actions. Exploring Avaaz’s repertoire of collective action demonstrates how Chadwick’s hybridized organizational identity applies to Avaaz as well as MoveOn. In the past two years, Avaaz has used protests, rallies, polling, petitions, TV and print ads, fundraising, meetings and convenings with stakeholders, and Youtube videos to move their agenda forward. Activities like petitions, fundraising and paid media campaigns are typically found in the repertoires of interest groups who use them “to exert pressure on mostly national, sometimes transnational, policy elites, usually without the need for mass mobilization” (Chadwick 285). Meetings and convenings with stakeholders including elected officials are usually found within repertoires of organizations working within the structures of national governments, which Chadwick categorizes as the typical tactics of the more conservative officially recognized parties. Tactics like protests and rallies fall squarely in the looser activities of social movements, characterized by “democratic experimentalism” and “transnational coordination.” Chadwick writes, “social movements typically eschew hierarchy, and depend upon mass mobilization to achieve their aims because they have usually been excluded from participation in mainstream channels or because they have deliberately sought to work outside the system to avoid cooption” (285). In addition to the three organization types describe above, Avaaz’s highly effective use of Youtube viral videos links the organization to two more types. In 2007, Avaaz released the video “Stop the Clash of Civilizations” which won the Youtube Awards in the political category and has garnered well over 2 million views and 50,000 comments on Youtube alone (the video is also available on other video sharing websites including Vimeo and DailyMotion). Viral videos of this sort generally fall into one of two camps—culture jamming  videos made by artists as a form of public activism, or corporate marketing campaigns. The intention of the Avaaz video is clearly cultural and can be categorized as culture jamming in nature, particularly as it has no commercial intent and even features music by DJ Spooky (Paul D. Miller), an electronic musician and writer who has himself been a culture jammer. But the video is also the product of sophisticated advertising agency Agit-pop and displays high (potentially very expensive) production values and a distribution model more in keeping with corporate viral marketing. In their application of viral marketing tactics, Avaaz again displays the hybridized organizational identity that Chadwick judges is not only made possible but encouraged by the Internet because the technologies set up “the organizational flexibility required for fast ‘repertoire switching’ within a single campaign or from one campaign to the next” (284). The perceived opposition of culture jammers to corporate structures makes this hybrid structure if not a paradox then at least a curiosity, but other literature delves deeper into the vulnerability of culture jamming activities to co-optation by the forces they oppose (Sandlin and Milam). In this case, viral marketing strategies offer Avaaz yet another avenue to reach people with their message and another facet to their organizational identity. Avaaz’s hybridized organizational format reflects the complex post-national and globalized landscape they operate in. To understand the values underlying Avaaz’s activities, we need to understand the ideoscape underlying Avaaz’s mission. Manfred Steger defines ideology as “comprehensive belief systems composed of patterned ideas and claims to truth. Codified by political elites, these beliefs are embraced by significant groups in society” (4). Steger also discusses the social imaginary, a background that ideology operates in and that provides “the most general parameters within which people imagine their communal existence” (5). Arjun Appadurai updates this concept for a postmodern context in his coinage of ideoscape. Ideoscapes are ideologies based on the imagination as social practice, composed of elements of political ideas, terms and images inspired by the Enlightenment worldview but negotiable between “sites of agency (individuals)” and “globally defined fields of possibility” (587, 591). Executive director Ricken Patel makes it clear that Avaaz’s mission is based on an ideoscape rather than an ideology by describing a fragmented world in which “we don’t see unified political will. We need citizens to come together across borders to form the political will to tackle issues” (Patel). 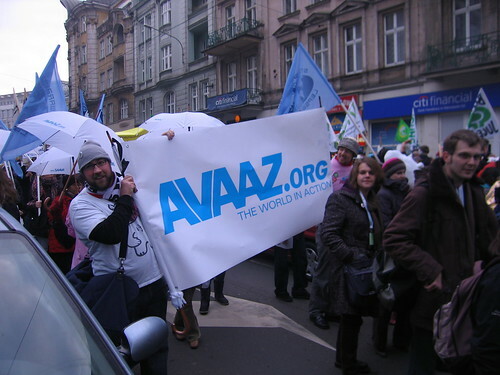 Avaaz’s stated mission “to close the gap between the world we have and the world most people everywhere want” concretizes Appadurai’s idea of imagination as social practice, using the organization as a large-scale site of agency that aggregates and drives member decisions to the global political and economic decision-making arena. This idea of mobilizing citizens across borders can be seen as a step beyond postnationalism, in which “multinationals and free-moving financial capital are today capable of bending national policy and therefore cancel the preconditions of national sovereignty for the majority of states” (Resina). Joan Resina’s extended discussion of postnationalism includes Habermas’ call for new political forms to recreate the democratic process outside the nation-state. She writes that “this sphere of democratic futurity lying ‘outside’ the nation-state is not a territorial reality but a ‘warping’ of national space produced by ‘global’ forces” and sees neoliberalism as the political expression of global postnational space. By moving beyond manipulating only the national (or even transnational) space to forging a unified global future, Avaaz is the political expression of the new globality. Patel sees Avaaz as providing an explicit response to postnationalism in his critique of the European Union, often held up as the quintessential postnational entity (Resina). Patel states, “When the EU formed, the technocrats made the decisions and left the people behind” (Patel). In Avaaz’s ideoscape, Patel sees a new development in how democratic expression and human rights actions create a new global imaginary: “We are seeing the closing of moral distance and people are valuing human life as precious…. Protecting life is not charity, it’s a matter of justice, it has been done. Part of what’s evolving right now is a sense of real global community and global justice” (Patel). If, as Chadwick argues, the repertoire of collective action reflects an organization’s values, then Avaaz’s repertoire accurately reflects its vision of a complex and globalized world and why it seeks to act on multiple fronts. Through its very existence, Avaaz upholds McLuhan’s central thesis that “the medium is the message” as applied to globalization theory. Gibbens defines globalization as “the intensification of world-wide social relations which link distant localities in such a way that local happenings are shaped by events occurring many miles away and vice versa.” By this definition, Avaaz is globalization at work. The examples set out in the introduction combine with numerous others to demonstrate how local or national events can be influenced by individuals living in very different locales and under entirely separate regimes. Through its nature as a bridging network, Avaaz provides information on local and global events, not only enhancing but creating the flows that characterize globalization. Avaaz’s broad repertoire of collective action accurately reflects Pieterse’s conception of “globalization as a multi-dimensional process” unfolding “in multiple realms of existence simultaneously” (658-659). Avaaz also reflects the influence of hybridized identities that geographic globalization has created in diaspora networks who wish to have an impact on home countries and policies as much as their new host countries (662). The online video “Stop the Clash of Civilizations” also reflects a coherent and informed rhetoric underlying its production and distribution. John R. Bowen writes in the Journal of Democracy that “ethnic thinking in political life is a product of modern conflicts over power and resources, and not an ancient impediment to political modernity,” and this idea is set out clearly in the two and a half minute video Avaaz made to kick off their campaign to call for peace talks in the Middle East (5). Contrasting two female figures who are respectively labeled with the vocabulary of stereotypes from the West versus East and Muslim versus Christian debates, the video plays with the labels to demonstrate how the same epithets can be applied to both groups. The piece draws into question the stark judgments made on both sides. The video goes on to lay out an argument that the clash of West and Muslim is based on fear mongering. “If the people lead,” the video says, “the leaders will follow.” The video also draws on Avaaz’s polling data to demonstrate that the majority of people in various regions want democracy and peace. Again, Avaaz combines strengths from a number of activities from their repertoire to promote a vision and argument of knowledge sharing appropriate to a bridging network. Having recently entered its tenth year, MoveOn.org is inspiring retrospective evaluations of its impact a decade along. One assessment, originally published in The Nation, is particularly intriguing in its implications for the pitfalls that Avaaz may face as it develops. First, membership growth may slow. The author Chris Hayes writes, “In the run-up to the Iraq War, MoveOn's membership exploded, from 600,000 to 1.6 million, but its rate of growth has slowed considerably since then.” Hayes attributes this to the possible impact of frustrations among members with the organization leadership as well as a changed political landscape in which the government has transitioned from one MoveOn opposed to one it is ostensibly allied with. In the case of Avaaz, the lesson here is to not get bogged down in national politics. The polarized state of politics in the US has done much to incite suspicion of MoveOn, and Avaaz has so far remained relatively untouched by nationally-based attacks in pursuing its high-minded and highly positive mission. In fact, it has instead inspired glowing mentions by global leaders and press, with David Miliband, the United Kingdom’s foreign secretary, recently lauding “the capacity for engagement with people on a global scale demonstrated by Avaaz” and a mention in the Economist (5). But a tempered response to recent campaigns in Canada indicate that Avaaz might face similar issues if it becomes too deeply involved in influencing national governance. Avaaz ads, like MoveOn ads, are designed to be provocative and to prompt more media coverage beyond just the one paid ad. As this example demonstrates, this type of move can backfire and generate highly critical coverage that, I would argue, does nothing to further the issue with media, opinion leaders, or the general public. Hayes believes that MoveOn is not accorded as much attention as it deserves. He mentions that Democratic staffers in DC are prone to confuse the organization with more radical efforts like Code Pink. “MoveOn's presence on the Hill … is not particularly strong; in Democratic Congressional offices, it's viewed more as an annoyance than a force. ‘I've never been in a room where someone says, Let's all check with MoveOn,’ said the former staffer.” For an organization that represents a larger population than 25 of the nation’s 56 states and territories, this seems too modest of a presence. Avaaz, if it continues to grow at a rapid pace, may have the opportunity to become a larger force in the as-yet loosely defined space of global politics. As Chadwick writes, “the globalization of public policy concerns, whether perceived or real, has opened up new spaces for nongovernmental actors to press for change in an increasingly fluid spacial and temporal environment” (289). For the moment, Avaaz is not yet defined or limited in the global sphere as people continue to learn about the organization and global leaders negotiate how exactly to respond their efforts and what level of interest to accord their activities. It is clear that many still don’t know the organization. This confusion is reflected in the public sphere, where one Canadian journal asked, “What’s Avaaz?” In the article, the author writes of the paid ads taken out opposing Stephen Harper’s re-election, “What's striking about the ads is that they're signed not by an opposition party, but by a single, strange word: Avaaz.” Avaaz’s ongoing efforts to work closely with actors in the global sphere bode well for the organization in avoiding some of the problems that MoveOn now faces. Avaaz’s organizational model, mission, and future direction reflect the trends of globalization in all their complexities. Its role in transforming members into activists and providing them with a megaphone to the international stage is an important development in enfranchising individuals around the world. There are many opportunities for Avaaz to continue to develop into a valued and important voice in global politics, and one can only hope that Avaaz succeeds in its mission to be the bridge between the world as it is and the world as most people want it to be. This article was published in Immediacy vol. 11, Fall 2009. Works Cited Anderson, Benedict. “Introduction.” Imagined Communities, rev. ed. London: Verso Books, 1991. Appadurai, Arjun. “Disjuncture and Difference in the Global Cultural Economy.” Durham and Kellner 584-603. Print. Avaaz. Website. Avaaz. N.p. n.d. Web. 10 Apr. 2009. < http://www.avaaz.org/en/>. Bowen, John R. “The Myth of Global Ethnic Conflict.” Journal of Democracy. National Endowment for Democracy and the Johns Hopkins University Press, 7.4 (1996) 3-14. Project Muse. Web. 23 Feb. 2009. Chadwick, Andrew. “Digital Network Repertoires and Organizational Hybridity.” Political Communication, 24 (2007): 283–301. EBSCOhost Communication & Mass Media. Web. 10 Apr 2009. Coffé, Hilde, and Benny Geys. “Measuring the Bridging Nature of Voluntary Organizations: The Importance of Association Size.” Sociology. 42. 2. (2008): 357–369. Web. 10 Apr 2009. Durham, Meenakshi Gigi, and Douglas Kellner. Media and Cultural Studies: Keyworks. Oxford: Blackwell, 2006. Print. Hayes, Chris. “MoveOn at Ten.” Christopher Hayes. Christopher L. Hayes. 17 Jul 2008. Web. 10 Apr 2009. <http://www.chrishayes.org/articles/moveon-ten/> Maira, Sunaina, and Elisabeth Soep. Introduction. Youthscapes: The Popular, the National, the Global. Philadelphia: University of Pennnsylvania P, 2005. xv-xxxv. Print. Miliband, David. “New Diplomacy: Challenges for Foreign Policy.” Social Europe. 3.1 (2007): 5. Web. 12 Apr 2009. <www.chathamhouse.org.uk/files/10188_190707miliband.pdf> Patel, Ricken. Personal interview. 3 Apr 2009. Pieterse, Jan Nederveen. “Globalization as Hybridization.” Durham and Kellner 658-680. Print. Resina, Joan Ramon. 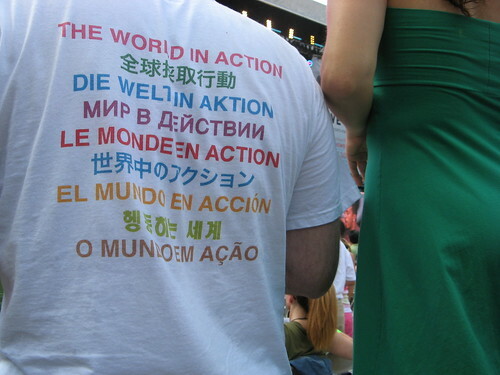 “The Scale of a Nation in a Shrinking World.” Diacritics. 33. 3/4. (2003): 45-74. Web. JStor. 12 Apr 2009. Sandlin, Jennifer A., and Jennifer L. Milam. “‘Mixing Pop (Culture) and Politics’: Cultural Resistance, Culture Jamming, and Anti-Consumption Activism as Critical Public Pedagogy.” 38. 3. (2008): 323-350. Academic Search Premier (EBSCO) Web. Solomon, Brett. Personal interview. 3 Apr 2009. “Stop the Clash of Civilizations.” Online Video. Avaaz and Agit-pop. Youtube. 5 Mar 2007. Web. 12 Apr 2009. < http://www.youtube.com/watch?v=WWyJJQbFago>. “Wakey Wakey.” Economist 15 February 2007. Web. 29 November 2008. <http://www.economist.com/world/international/displaystory.cfm?story_id=8703047>. “What's Avaaz?” Vancouver Sun. 11 Oct 2008. Web. 12 Apr 2009. <http://www2.canada.com/vancouversun/news/story.html?id=b7226e2a-548f-4888-9e1c-9b0af8c36c9d>. Culture jamming, practiced by those seeking to “critique and (re)form how culture is created and enacted in our daily lives” re-formulates commercial cultural products with a subverted meaning (Sandlin and Milam).